Oscar Robertson is among the greatest guards in NBA history and one of the most versatile players from the early period of professional basketball. 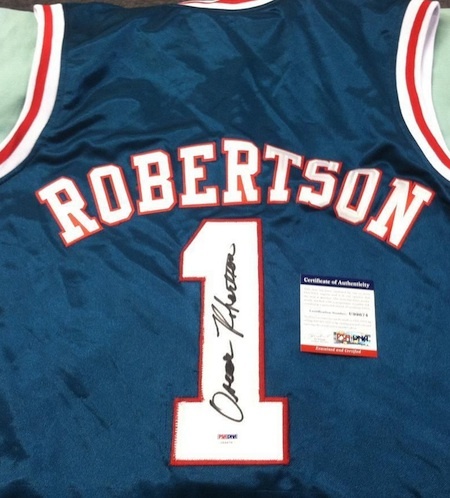 Nicknamed "The Big O," Oscar Robertson cards and autographs maintain strong values. Shop for Oscar Robertson Cards on eBay. After a stellar high school career in Indiana, Oscar Robertson elected to play college basketball at the University of Cincinnati. The only thing that missing from his impressive college career was an NCAA title, although Robertson did lead the team to two Final Four appearances. When Oscar Robertson left the University of Cincinnati for the NBA in 1960, he did so as as the all-time NCAA scoring leader and a three-time College Player of the Year. His scoring record would be later broken by Pete Maravich. Robertson also led team USA to the 1960 Gold Medal as a member of the amateur Olympic basketball team. As it happened, the local pro team, the Cincinnati Royals, held the first pick in the 1960 NBA Draft. They selected Oscar Robertson with their territorial pick, but he is still viewed as the number one overall pick because Cincinnati would have taken him either way. He immediately lived up to that selection and was named the 1961 NBA Rookie of the Year. From there, Robertson saw considerable success, including an MVP award in 1964. In 1970, the 12-time NBA All-Star was surprisingly traded to the Milwaukee Bucks. 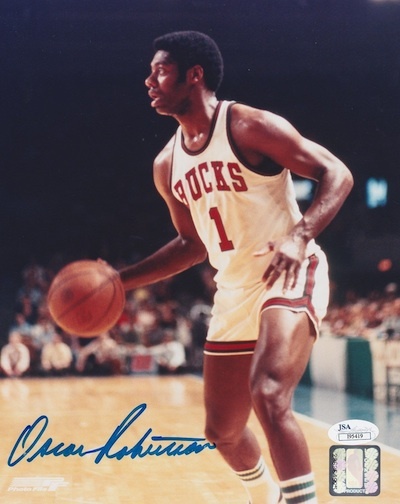 Paired with Lew Alcindor, Oscar Robertson won his only title during that first season with the Bucks and spent his final four years with the team. Oscar Robertson retired in 1974 and was inducted into the Basketball HOF in 1980. Of particular note, Oscar Robertson is the first and only player in NBA history to average a triple-double for an entire season. He achieved that feat during the 1961-62 season, averaging 30.8 points, 12.5 rebounds and 11.4 assists per game. 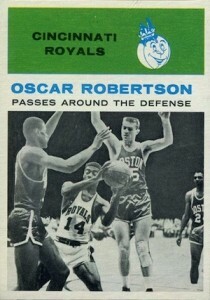 From a cardboard perspective, Oscar Robertson's career is sparse. Outside of his 1961-62 Fleer rookie, official NBA cards were not available again until 1970. However, since his retirement, collectors have seen a gradual increase in cards. Robertson has been regularly featured in products since the late-1990s and although his autographed cards remain rare, they have become more common in recent years. The best place to look for Oscar Robertson autograph cards is with recent Panini or Leaf products. Collectors looking for the very first Oscar Robertson card to depict him as a pro might be a bit surprised. Proclaiming the tagline, " The Wiener The World Awaited," Kahn's Wieners issued a 12-card set featuring Royals' players and also Jerry West of the Los Angeles Lakers. Slightly oversized (3-1/4" x 3-15/16"), these black-and-white cards are mostly considered oddball. Nevertheless, they remain an intriguing option for collectors short on available vintage cards for "The Big O." The only official rookie card for Oscar Robertson is also fortunate to come in one of the best-looking sets of all-time. 1961-62 Fleer is a cardboard masterpiece and these popular cards are the only major release of the decade. The red-orange combo works nicely with the black-and-white image of Oscar Robertson. Centering remains an issue, but even low grade or raw versions go for around $100. 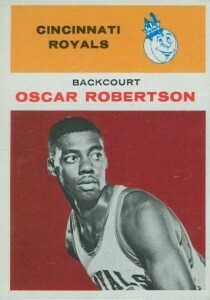 A cheaper alternative for collectors, Oscar Robertson's second card in 1961-62 Fleer is part of the "In Action" subset. 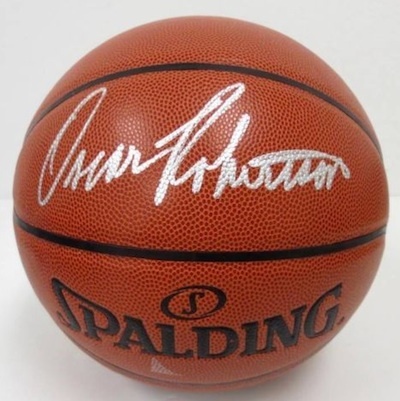 Below you will find an example of what Oscar Robertson's authentic signature looks like. This can be used as a first point of reference for determining the legitimacy of autograph memorabilia, but is not a substitute for having your items authenticated by a well-respected professional autograph authentication company. Reputable authentication companies include JSA, PSA, Panini Authentic and Mounted Memories, to name a few. 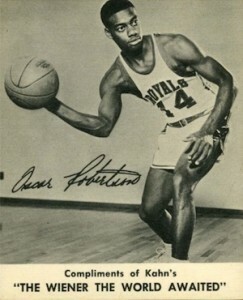 Oscar Robertson signs in large cursive and his writing is very legible. Instead of signing his full name, Robertson is also known to sign just "Big O" or "The Big O." The signature begins with a large "O" that normally makes a full circle. The pen lifts and then "s-c-a-r" is written out clearly. The "s" is not normally connected on the bottom, looking more like an "r."
A large "R" immediately transitions into "o-b-e-r-t-s-o-n." All letters are legible and easily distinguished. The "b" is reminiscent of a "k" and the "t" is normally crossed. 1970-71 TOPPS #100 OSCAR ROBERTSON !!! PSA 7 !! NM ! !